Boiling Point Blog: Feminist, LGBT and progressive political cartoons: Veep Contenders: An exclusive peek at McCain's top picks! 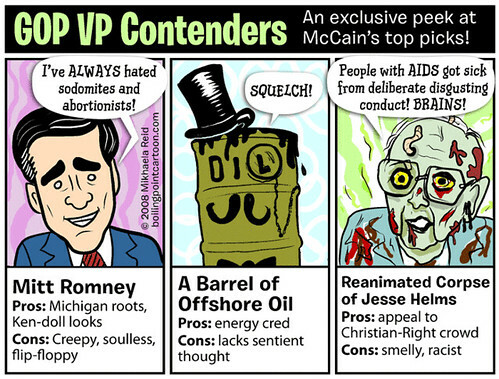 Veep Contenders: An exclusive peek at McCain's top picks! Because I couldn't resist doing a retroactive poke at world-class segregationist, gaybasher and AIDS-funding squasher Jesse Helms. Also, I hate Mitt Romney. And John McCain, of course.